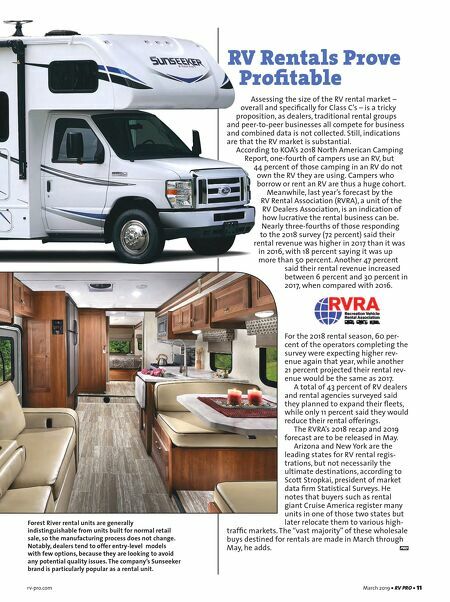 rv-pro.com March 2019 • RV PRO • 11 RV Rentals Prove Profitable Assessing the size of the RV rental market – overall and specifically for Class C's – is a tricky proposition, as dealers, traditional rental groups and peer-to-peer businesses all compete for business and combined data is not collected. 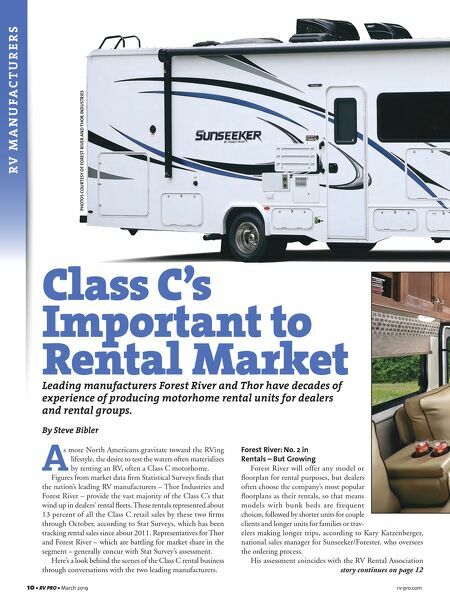 Still, indications are that the RV market is substantial. According to KOA's 2018 North American Camping Report, one-fourth of campers use an RV, but 44 percent of those camping in an RV do not own the RV they are using. Campers who borrow or rent an RV are thus a huge cohort. Meanwhile, last year's forecast by the RV Rental Association (RVRA), a unit of the RV Dealers Association, is an indication of how lucrative the rental business can be. Nearly three-fourths of those responding to the 2018 survey (72 percent) said their rental revenue was higher in 2017 than it was in 2016, with 18 percent saying it was up more than 50 percent. Another 47 percent said their rental revenue increased between 6 percent and 30 percent in 2017, when compared with 2016. For the 2018 rental season, 60 per- cent of the operators completing the survey were expecting higher rev- enue again that year, while another 21 percent projected their rental rev- enue would be the same as 2017. A total of 43 percent of RV dealers and rental agencies surveyed said they planned to expand their fleets, while only 11 percent said they would reduce their rental offerings. The RVRA's 2018 recap and 2019 forecast are to be released in May. Arizona and New York are the leading states for RV rental regis- trations, but not necessarily the ultimate destinations, according to Scott Stropkai, president of market data firm Statistical Surveys. He notes that buyers such as rental giant Cruise America register many units in one of those two states but later relocate them to various high- traffic markets. The "vast majority" of these wholesale buys destined for rentals are made in March through May, he adds. Forest River rental units are generally indistinguishable from units built for normal retail sale, so the manufacturing process does not change. Notably, dealers tend to offer entry-level models with few options, because they are looking to avoid any potential quality issues. The company's Sunseeker brand is particularly popular as a rental unit.